A plugin that teleports you to a random location when you execute the command. 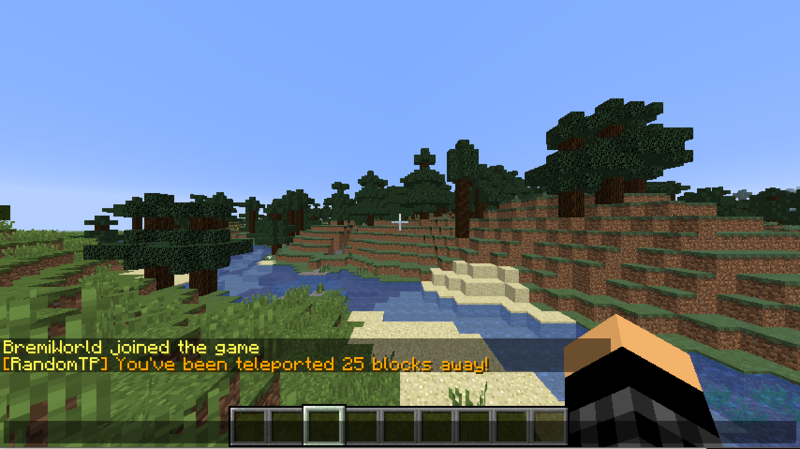 RandomTP is a plugin that allows you to teleport to a random place. The plugin will send you between 1 and 100 blocks away from your actual position. Also, if you would like it to teleport you more blocks away you can contact me via Discord and I can send you an edited version of the plugin with the ammount of blocks that you want to be teleported away. It works with all versions from 1.7 to 1.13! There are no permissions on this version of the plugin. It's one of my first plugins, so don't feel mad to tell me if you find a bug of if you have a suggestion. All comments will be appreciated. Don't forget to rate the plugin! It's great and all, but I did /randomtp at spawn and it sent me to the same faction base 3 times in a row. Which is kind of rare for a random tp plugin. Does what it says its supposed to and doesn't cause any other problems! I do not use this plugin but is seems very nice! Fixed. Thanks for reporting that issue, but please don't rate the plugin with 1 star just because of this. A helpful plugin to control the chat.